Fssai Recruitment 2019 | BE/Btech/Bsc/ME/MTech/Any Graduates/12th | 275 posts for freshers/experience - Sarkarinewjob.com A ultimate job portal to provide employment news. 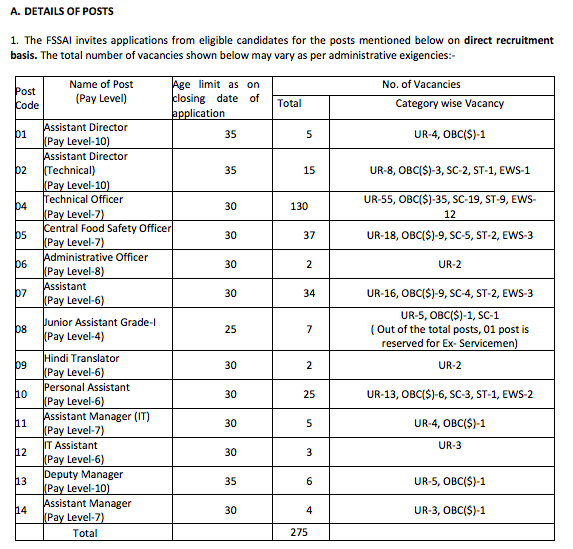 FSSAI Recruitment 2019-20: Apply Online for 275 Junior Assistant Grade I, Technical Officer, More Vacancies in FSSAI Recruitment 2019-20 Across India. OR BE or B.Tech in Food Technology or Dairy Technology or Biotechnology or Oil Technology or Food Process Engineering or Food Processing Technology or Fruit & Vegetable Technology or Food Safety & Quality Assurance or Bachelor’s degree (not less than four years duration) in Medicine or Veterinary sciences or Fisheries or Animal Sciences. Note 1: Qualifications are relaxable at the discretion of the competent authority in the case of candidates otherwise well qualified. or (ii) any other equivalent or recognized qualification notified by the Central Government. Educational and other qualifications : Bachelor’s Degree from a recognised University or Institution. Educational and other qualifications Bachelor’s Degree with atleast one year PG Diploma/Degree in Computer Application or Information Technology or equivalent degree in relevant field. OR Bachelor’s Degree in Computer Application or equivalent degree in relevant field. Exam centre are all over india , check notification for details , Candidates can give 3 options of centres in the online application in order of preference.